This week we’re sharing two interviews. You can download it here. 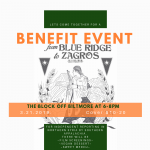 In Asheville, there’s an event we’re happy to share coming up to support local solidarity and infosharing efforts between Rojava and Appalachia. From 6-8pm at The Block Off Biltmore on Thursday, March 21st. The event will have vegan deserts, a film screening and sweet, sweet merch to help the effort. More info coming soon.